Established in 1955, Agricultural Services is an employee-owned company with a single goal: to help our customers raise the best crops possible. 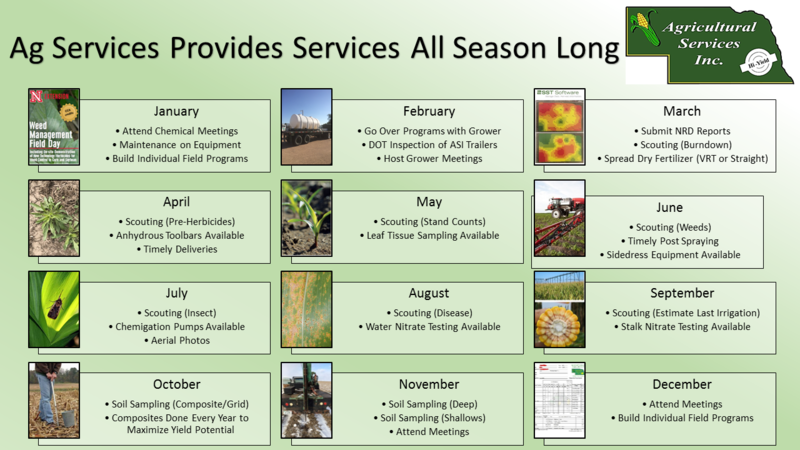 Our agronomy facilities are conveniently located in seven central Nebraska locations. Agricultural Services, Inc. is the crop production specilalist providing area producers the best customer service and quality products to grow high yields. As our name implies, Agricultural Services, Inc. is a service oriented company. Our business model requires that we be the best crop production specialists in our trade areas. Agricultural Services does not merely sell crop input commodities. We sell total crop production that provides our customers the best total value for dollars spent on crop inputs! Fields need to be observed on a regular basis. We accept that responsibility. Therein lies the value that growers have come to realize from Agricultural Services, Inc.